Rich, buttery puff pastry wrapped around a tart homemade strawberry rhubarb pie filling baked until it’s golden brown, crisp and flaky, and drizzled with a sweet vanilla glaze. After I baked my Strawberry Rhubarb Pie with a Streusel Top, I still had plenty of rhubarb left from the big bunch my mother-in-law had given me. Since my family loved the Puff Pastry Raspberry Hand Pies I made a few months ago, I decided to make another batch of the strawberry rhubarb pie filling and use it to fill hand pies. If you’re afraid of making pie crust, you’ll love this easy recipe. It uses frozen puff pastry dough so the recipe comes together in a flash. I find it’s easier to cut the dough in to squares and then roll the squares out to the right size, rather than rolling out the big sheet of dough to the right size and then cutting the squares. Use egg wash and a fork to seal up the edges as tightly as possible. If you can avoid getting the pie filling on the edge that will help your turnovers seal up better too. Although, even if some of them do leak filling, they’ll still taste delicious. After I made the hand pies, my son asked if he could have a turnover, so I decided to call them turnovers instead of hand pies. I suppose if they’re a triangle shape they’re turnovers, and if they’re square they’re hand pies? 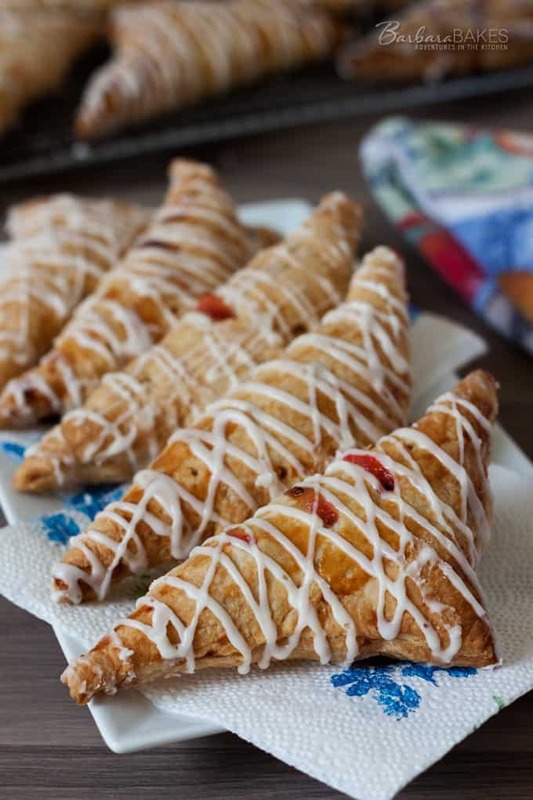 Whether you call them hand pies or turnovers, you’ll call them delicious! Mix sugar, cornstarch, and salt in large microwave-safe bowl. Mix in water and rhubarb. Microwave on high, stirring occasionally, for about six minutes or until the rhubarb is tender and liquid has thickened to the consistency of jam. Cool to room temperature, about 30 minutes. Mix in strawberries and orange zest. Preheat oven to 425°. Line two baking sheets with parchment or silpat. Unfold pastry sheet on a lightly floured surface. 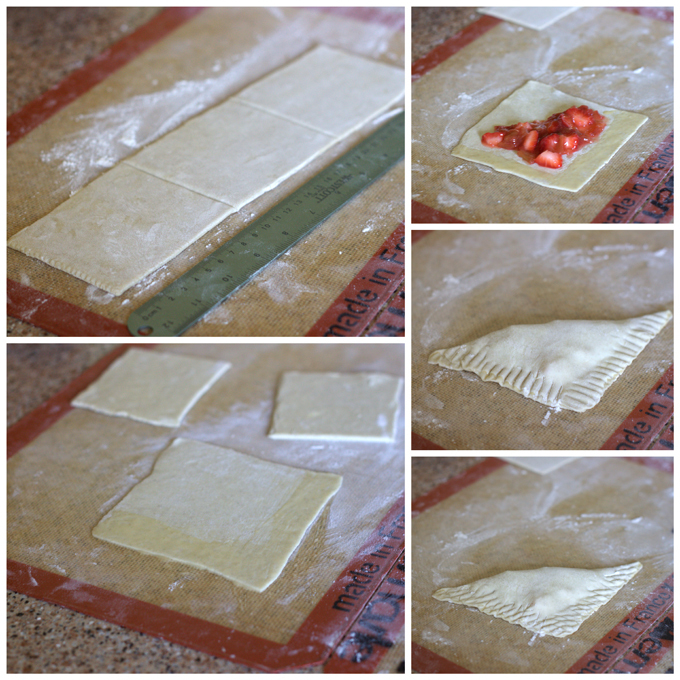 Cut each pastry sheet in to 3 rows. Roll each row so it’s 12 inches long. Cut each row in to 3 squares. Roll each square to a 5-inch square. Turn the square so it’s on an angle and egg wash the two front edges. Put a spoonful of filling in the middle of the square and fold the top triangle over the bottom triangle. Seal the edges together with the tines of a fork. Snip the top in three places to release steam. Put trays in the freezer for 10 minutes. Remove from freezer and brush top with egg wash and a sprinkle of sugar if desired. Bake pies 5 minutes. Reduce oven temperature to 350° and bake 25 minutes more until golden brown and puffy. Rotate the trays the last 10 minutes of cooking. Whisk together powdered sugar, water, and vanilla until smooth. Add water a little at a time and add more powdered sugar or water as necessary. Drizzle glaze over hot turnovers. A few thoughts: Personally, I thought the amount of orange was just right. But – I used a microplaner as opposed to peeling off strips of orange zest with a vegetable peeler. Re. oven heat – buy an inexpensive oven thermometer and check your oven temp. periodically, as it can vary over time. Handling. STORE IN FREEZER UNTIL READY TO BAKE. STORE BAKED PRODUCT IN COOL, DRY PLACE. Storage. Shelf Life: 1 YEAR FROZEN. Storage Temperature: 0 °F. So I did the complete preparation, popped them in the freezer on a cookie sheet until they were frozen, and then packaged them in plastic wrap. I do recommend using parchment paper or Silpat, as my turnovers were a bit leaky compared to the commercially prepared product. Finally – stick them in the oven while you are eating your main course. This will allow you to serve them while they are still warm. Will let you know if this is an utter failure! Hello! I stumbled across your site while looking for rhubarb pastry recipes. I had a bit of trouble with this recipe. My first issue was regarding the orange zest. It’s mentioned in the ingredients but not the actual recipe. It called for 1 tablespoon of zest which I assumed you meant to be added with strawberries as that’s the order it’s listed in your ingredients and all the other ingredients are listed in descending order of usage. I thought 1 tablespoon might be too much so I scaled it back to 1 tsp. Even with this decrease in orange, it was still the first thing I tasted upon biting into these, they were delicious, but not as rhubarb-y and strawberry-ish as I would have liked. For me, these took about ten mins less than the suggested cooking time to get puffy and golden brown. The other issue I had was with the glaze and glazing while hot. As suggested the glaze was too runny (even with 1 tablespoon water) and if I glazed them warm the glaze just disappeared. So I had to fiddle with the glaze proportions and actual made it twice because I didn’t have enough, and wait a bit until they had cooled. All and all they taste and look beautiful! Baking is not an exact science, part of it is adjusting on the fly to your oven/altitude. I will make these again but omit the orange zest completely. I love the idea of doing these with cinnamon apple filling. Thank you. Hi Lauren – glad you enjoyed the turnovers. I think a lot depends on how flavorful your rhubarb and strawberries are and how much you like the orange flavor. I personally love the brightness of the orange but I know my daughter prefers her strawberries without out it too. I’ve found that often puff pastry looks done on the outside, but cooking them a little longer prevents the turnover from collapsing when you remove them from the oven. So as long as they’re not getting too brown, try cooking them a bit longer so the inside layers are fully baked as well. Of course, you’re right every oven is different and yours could have been baked with a shorter time. If you live in a humid climate, you’ll need less water when making the glaze. Thanks for the heads up about the missing ingredient in the recipe. I’ve updated it as well as suggesting adding the water a little at a time to the glaze. I have another question. How do you store these? I made these yesterday to take to work today for a meeting and they are all soggy now. 🙁 I could seriously cry. They were so wonderful last night. I’m assuming my putting these in airtight containers was the problem, I put them single layer in tupperware. Sorry Lauren – they really are best eaten when they’re freshly made and then stored in a paper bag. You could try wiping off the icing and baking them again to crisp them up and then icing them again. These look yummy!Can’t wait to try them. Your pastry turnovers are the BEST Barbara! Thanks for another great recipe! Oh I love these! What a beautiful dessert! 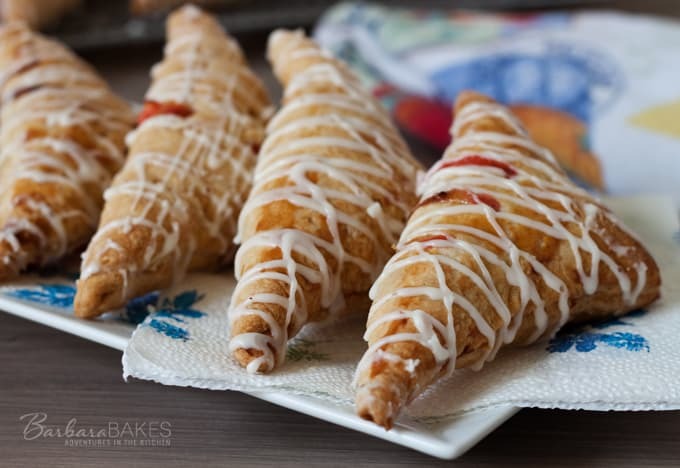 What perfect little turnovers……and what a combo-one of my favorites. They look delicious, Barbara. I’ve got to find some rhubarb plants and start a patch here-I’m missing out on too many good recipes using it. I love working with puff pastry – not making it. The result is a gorgeous dessert that makes me look like a hero. Your turnovers are smashing. So simple to prepare and I am sure they are really yummy! Rhubarb and strawberry are such a great pairing for those summery pastries. They must have tasted heavenly. Wow, Barbara, these look amazing! Pinning for sure! Oh my!! So yummy! I love baking fun things like this with puff pastry! Isn’t frozen puff pastry the best thing ever? It makes a lovely dessert like this so easy and do-able, even on a busy day. And strawberry rhubarb? Sublime! What terrific turnovers! I’m charmed by all the bright seasonal flavor and ease of preparation in this scrumptious recipe. Beautiful and perfect! They must be delicious.